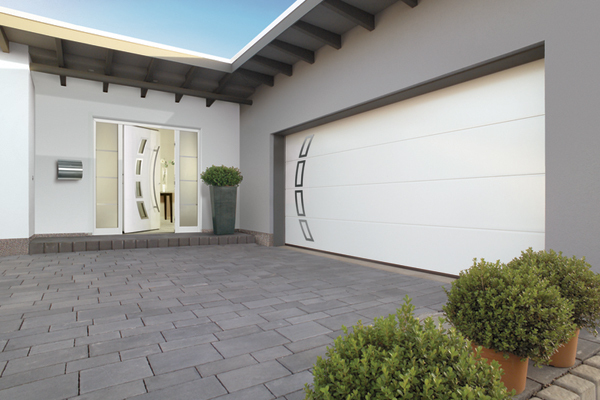 Hormann, a market leader in residential, commercial and industrial doors, has announced the launch of its double-skinned LPU 67 sectional garage doors that open vertically upwards and can be suspended under the ceiling to save space. They offer excellent thermal insulation achieved by sections with thermal break with a U-value of 0.33 W/ (sq m K), a very good seal on spaces between sections with double-lip seals and an optimum floor connection using double bottom seals, which also compensate for floor unevenness and energy losses, said a statement from the German group. For those seeking ways to isolate air-conditioned areas, the LPU 67 thermo sectional garage doors have been designed to achieve the company’s lowest ever U-value, providing up to 50 per cent more thermal insulation than previous models. It achieves this by using 67-mm-thick, polyurethane foam-filled panels and double-lip seals on all four sides. A well-insulated garage door is always recommended when the garage and the home are directly connected, it added. Darius Khanloo, the managing director, Hormann Middle East and Africa, said: "Since the sectional doors open vertically upwards, you can make full use of the space inside and in front of the garage. The comfort and convenience LPU 67 make it the best choice for garage doors." "The LPU 67 thermo is also available in a variety of finishes, colours, and glazing options. At Hormann, our clients are guaranteed to find a sectional garage door of their preferred style," he noted. According to him, the door comes with an anti-theft kit that ensures the door is locked automatically when there is any forced opening. "The surface is protected against rust because of the use of hot-galvanized material and the high-quality polyester-primer coating on both sides, leaving no room for any streaky marks," explained Khanloo. "Solid timber doors come with two types of timber, each can be glazed in one of eight colours, while steel doors are available with 15 equally-priced different preferred colours," said Khanloo. "In the premium version of the LPU 67 Thermo, the fitting parts, frames, tracks and connections come in a high-quality polyester powder coating. This is finished in Grey White RAL 9002, giving the interior of the door an exclusive look," he added. An internationally-oriented, fast-growing company in the construction supplier industry, Hormann said the doors, hinged doors, frames and operators are manufactured for the markets in Europe, North America and Asia at 38 highly-specialised factories.